Because our school is Leader In Me-focused, we have lots of discussions about being proactive and thinking win-win. One of the ways I like to make these ideas relatable, especially to some kids who struggle with these concepts the most, is to use analogies that they are all familiar with and can easily relate to. My favorite question to ask these days is not, "Are your being proactive or reactive?" but is instead, "Is this a Soda Kid choice or Water Kid choice?" All kids know what happens when you shake a can or bottle of soda: it explodes! All over the floor, your clothes, your hands.... everywhere! It's a mess and takes a long time to clean up. But what happens when you shake a bottle of water and then open it? Nothing! The water is just water- ready to drink and enjoy (and as one of my thirdsters pointed out, it's much healthier for your body than soda is, too!). So how does this relate to our class and our personal reactions when life happens, situations are out of our control, or it feels like we're getting shaken and thrown around in all different directions? When your reaction comes out, is it one of soda or water? Soda choices are made spur-of-the-moment, usually pure reaction, and are often filled with anger. They are messy and it usually takes a while to "clean up" and repair the harm. Water choices, however, are calm and in-control, even despite the hardest shaking. We spoke about how our bodies even feel like soda or water on the inside, especially in the heat of the moment, and talked about some of our Brain Break and cool-down strategies to get our body to water when it feels like exploding soda. I set up this chart like I usually do when I compare two things, in a T-Chart. This was ready to go when we began our discussion and we brainstormed as a class how one type of person would react versus the other. 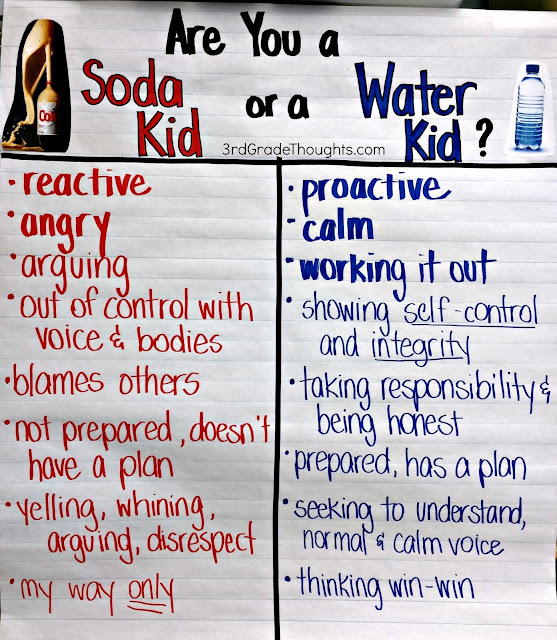 It was a very concrete and helpful way for kids to see proactive versus reactive thinking and, now that it's hanging in our classroom, we can refer back to it throughout the weeks ahead and simply notice where their reaction is falling: Soda or Water? I absolutely love this! It is such a clever analogy and one I'm sure the kids will easily understand. I can't wait to create an anchor chart with my 3rd graders tomorrow. I love this idea. I shared it with the two schools that I work with. Thanks for a great idea! Can't wait to use this as part of class meeting! Love it! There is a great book called Soda Pop Head that would go brilliant with this anchor chart! Thank you, thank you, thank you! My kiddos need so much character education and I have been wanting to include lessons (but where does the time come from?!) This looks so great and will be extremely helpful as a starting off point for some class meetings!! Loved it! waiting to use it!